SUBHEAD: They failed because we Europeans did not want to subject ourselves to American demands. Thank God! Image above: Germans protest TTIP trade deal. From original article. In the latest blow for Obama's global trade agenda, German Vice Chancellor and Economy Minister Sigmar Gabriel said that free trade talks (Trans-Atlantic Trade and Investment Partnership, or TTIP) between the European Union and the United States have failed, citing a lack of progress on any of the major sections of the long-running negotiations. He added that in 14 rounds of talks, the two sides haven't agreed on a single common item out of 27 chapters being discussed. Among the stumbling blocks is a US objection to opening public tenders to European companies. “For me, that goes against free trade," Gabriel previously commented regarding the issue. But more than just disagreement on general principles, Gabriel singled out the US as the party making strong demands with no concessions: "We mustn't submit to the American proposals," said Gabriel, who is also the head of Germany's center-left Social Democratic Party. Despite strong misgivings among many EU member states over the TTIP, especially by farmers in the European block, both Washington and Brussels had pushed for a deal by the end of the year. As AP reports, Sigmar Gabriel compared the TTIP negotiations unfavorably with a free trade deal forged between the 28-nation EU and Canada, which he said was fairer for both sides. As AP adds, Gabriel's ministry isn't directly involved in the negotiations with Washington because trade agreements are negotiated at the EU level. But such a damning verdict from a leading official in Europe's biggest economy is likely to make further talks between the EU executive and the Obama administration harder. Surprisingly, Gabriel's comments contrast with those of Chancellor Angela Merkel, who said last month that TTIP was "absolutely in Europe's interest." 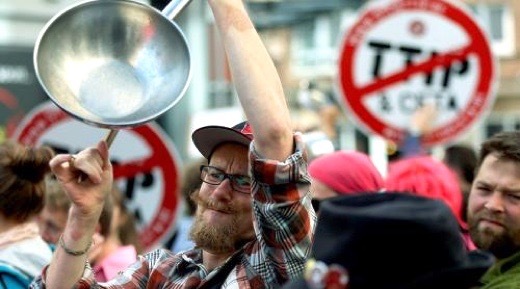 European critics of the TTIP have claimed that the treaty is dangerous as it could place the interest of international corporations above those of the nations they operate in, and undermine European standards for labor and environmental protections. Germany, where support for the TIIP has plunged over the past year, has seen a number of popular protests demanding that the TTIP never be implemented. A recent survey, conducted by YouGov for the Bertelsmann Foundation, showed that only 17 percent of Germans believe the Transatlantic Trade and Investment Partnership is a good thing, down from 55 percent two years ago. Even in the US, support for Obama's trade agenda has tumbled, with only 18% supporting the deal compared to 53 percent in 2014. The European public has been unhappy with TTIP as the contents of the deal remain largely secret. However, recent leaks suggest that it will affect food safety laws, environmental legislation, banking regulations and open the EU for GM crops. Opponents of the deal have been staging protests in a number of European cities. The most recent one took place in Berlin last weekend, with activists calling for a nationwide demonstration on September 17th. With Gabriel saying the TTIP is effectively dead, Germany joins France, whose president Hollande said in early May that the "TTIP is doomed" adding that France "will never accept" challenges to its farming and culture in exchange for better access to U.S. markets. "That's why at this stage, France says no," the Socialist leader said at a conference on left-wing politics. French Trade Minister Matthias Fekl then said that negotiations "are totally blocked" and that a halt to talks "is the most probable option." "Europe is giving a lot ... but receiving very little in return," he concluded. Which, incidentally, is precisely how the US wanted it. It remains to be seen if the US will offer concessions to Europe now that the TTIP debate is all but finished, or if the US will demand strict adherence to rules that now clearly benefit mostly US corporations.